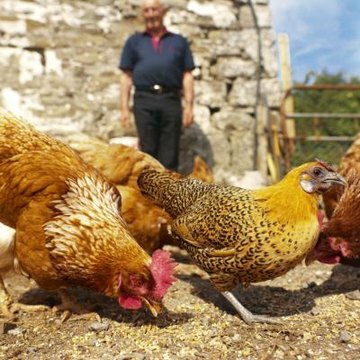 With the price of chicken feed always going up, it can be frustrating when it goes to waste as birds defecate on it or scattering it in the coop bedding. To prevent waste, hang or secure your feeder at a height that keeps it from underneath your birds' feet. Whether you affix your feed box to the side of your coop or use a free-standing one, either purchased or homemade, it should seat at the level of your adult chicken's back to discourage her from trying to scratch out the feed with her feet. You can, however, position a feeder as little as an inch off the ground if you have a mom with chicks, though. Hang the feeder where fixtures could give a chicken a leg up enough to perch in the food.